Each month we host a Graphic Novel Book Club meeting, open to all, during which we hang out and informally discuss a featured graphic novel. 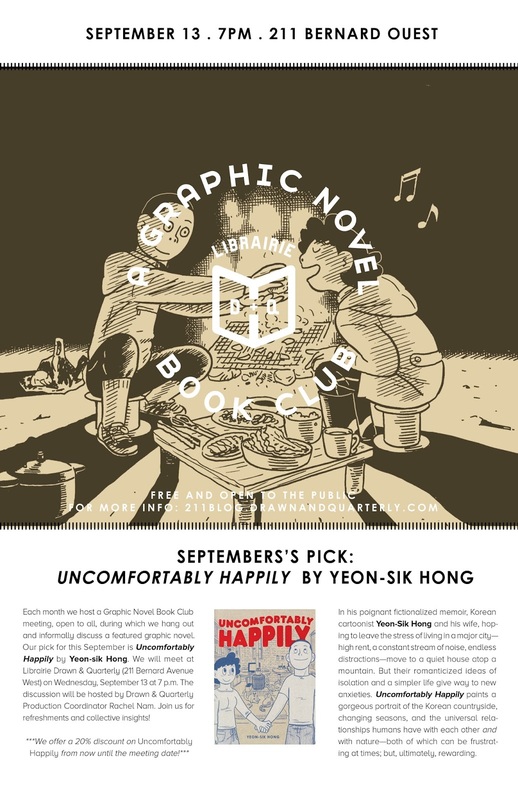 Our pick for this September is Uncomfortably Happily by Yeon-sik Hong. We will meet at Librairie Drawn & Quarterly (211 Bernard Avenue West) on Wednesday, September 13th at 7 p.m. The discussion will be hosted by Librairie Drawn & Quarterly Production Coordinator Rachel Nam. Join us for refreshments and collective insights! In this poignant and beautifully honest fictionalized memoir, Korean cartoonist Yeon-Sik Hong leads us through his and his wife’s move from the chaos of apartment-living in Seoul to a quiet house atop a mountain in the countryside. It is though this move that Hong and his wife hope to leave the stresses provided by living in a major city like Seoul—high-rent, a constant stream of noise, endless distractions. But what they romanticize about the isolation and a simpler life proves to present new anxieties. Uncomfortably Happily paints a gorgeous portrait of the Korean countryside, changing seasons, and the universal relationships humans have with each other as well as with nature, both of which can be frustrating at times but ultimately rewarding.